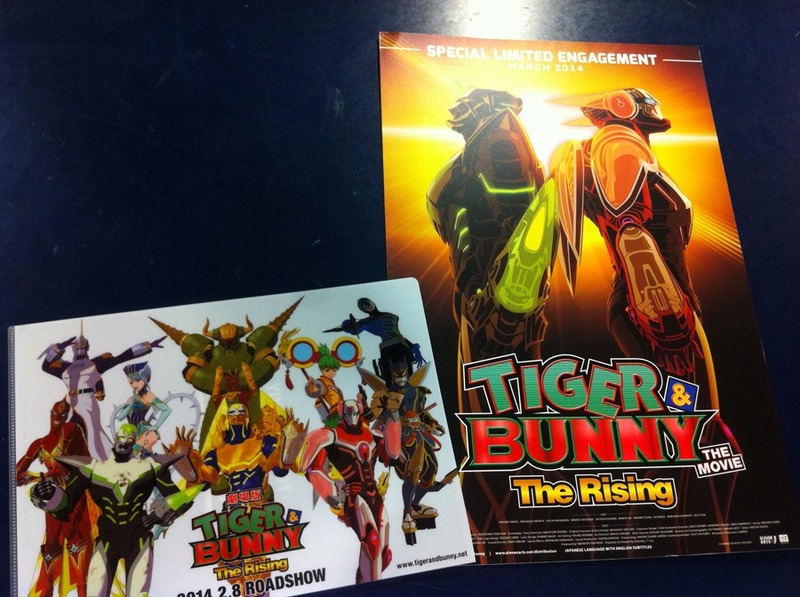 Tiger & Bunny: The Rising–Bunny Is The Mature One? The second Tiger & Bunny film, Tiger & Bunny: The Rising will be appearing in twenty American cities – including New York, Chicago, Los Angeles and Seattle – beginning Saturday, March 15th. This time around, Bunny gets a dose of his own medicine as he is moved back to first link and paired with up and coming new hero, Golden Ryan – who comes with awesome power and an equally awesome ego! Naturally, their first case together could wind up in disaster for Stern Bild. For more details – plot synopsis, link to screenings list – check out the press release after the jump. San Francisco, CA, January 31, 2014 – VIZ Media, LLC (VIZ Media), the largest distributor and licensor of manga and anime in North America, teams with Los Angeles-based film distribution company ELEVEN ARTS to bring the riveting anime action of TIGER & BUNNY THE MOVIE: THE RISING to a host of major U.S. cities for series of special theatrical screenings beginning Saturday, March 15th. A special screening scheduled for March 22nd brings the hero-inspired big screen action of the smash hit anime property home to the Bay Area for a very special theatrical event to be held at the NEW PEOPLE Cinema, located inside the dynamic Japanese pop culture entertainment venue in San Francisco’s Japantown at 1746 Post St. Details for this screening will be announced soon on the TIGER & BUNNY Facebook page at: https://www.facebook.com/TigerAndBunny. In TIGER & BUNNY THE MOVIE: THE RISING, the heroes are back in an all-new feature-length film! Kotetsu T. Kaburagi, a.k.a. Wild Tiger, and Barnaby Brooks Jr.’s partnership comes to a sudden end when Apollon Media’s new owner Mark Schneider fires Kotetsu and moves Barnaby back into the First League, pairing him up with Golden Ryan, a new hero with awesome powers and a huge ego to match. When the heroes are sent to investigate a string of strange incidents tied closely to the city’s Goddess Legend, they discover three superpowered NEXTs plotting to bring terror and destruction to Stern Bild. VIZ Media is the also distributor of the TIGER & BUNNY manga series (rated ‘T’ for Teens), which features artwork by Mizuki Sakakibara and is based on the smash hit animated series, created by the famed Tokyo-based anime studio Sunrise. VIZ Media also licenses and distributes the popular TIGER & BUNNY feature film and anime series that are available on DVD/Blu-ray as well as on the company’s Neon Alley 24/7 anime channel. ELEVEN ARTS is the Los Angeles based film distribution company that has brought many acclaimed Japanese films, live-action and animated features, to North American audiences. ELEVEN ARTS’s major live-action titles include Japan Academy Awards winner Memories of Tomorrow (starring Ken Watanabe) and Oscar nominated director (with The Twilight Samurai in 2004) Yoji Yamada’s samurai film Love and Honor. ELEVEN ARTS is also a respected distributor of popular animation titles such as the Evangelion franchise, Fullmetal Alchemist: The Sacred Star of Milos, and Puella Magi Madoka Magica The Movie Part 1: Beginnings/ Part 2: Eternal/ Part 3: Rebellion. For additional information, go to www.elevenarts.net. Headquartered in San Francisco, California, VIZ Media distributes, markets and licenses the best anime and manga titles direct from Japan. Owned by three of Japan’s largest manga and animation companies, Shueisha Inc., Shogakukan Inc., and Shogakukan-Shueisha Productions, Co., Ltd., VIZ Media has the most extensive library of anime and manga for English speaking audiences in North America, the United Kingdom, Ireland and South Africa. With its popular digital manga anthology WEEKLY SHONEN JUMP and blockbuster properties like NARUTO, BLEACH and INUYASHA, VIZ Media offers cutting-edge action, romance and family friendly properties for anime, manga, science fiction and fantasy fans of all ages. VIZ Media properties are available as graphic novels, DVDs, animated television series, feature films, downloadable and streaming video and a variety of consumer products. Learn more about VIZ Media, anime and manga at www.VIZ.com. Previous PostCaptain America: The Winter Soldier–The Teaser To The Super Bowl Spot!Next PostArtists Rally Around Usagi Yojimbo Creator with Tribute/Benefit Book!